Heat oven to 350° F. Spray 13x9-inch (3-quart) glass baking dish with cooking spray. Pour 1/2 cup of the salsa in baking dish. In large bowl, stir together chicken, beans, corn, sour cream and 1 cup of the cheese. Spoon about 2/3 cup filling onto center of each tortilla. Fold bottom third of tortilla over filling; fold in sides toward center, leaving top open. Place burritos, seam sides down, on salsa in baking dish. Spoon remaining 1 cup salsa over filled burritos. Sprinkle with remaining 1 cup cheese. Bake uncovered 20 minutes or until cheese is browned and melted. Garnish with onions. For a spicy version, use medium salsa and pepper Jack cheese. 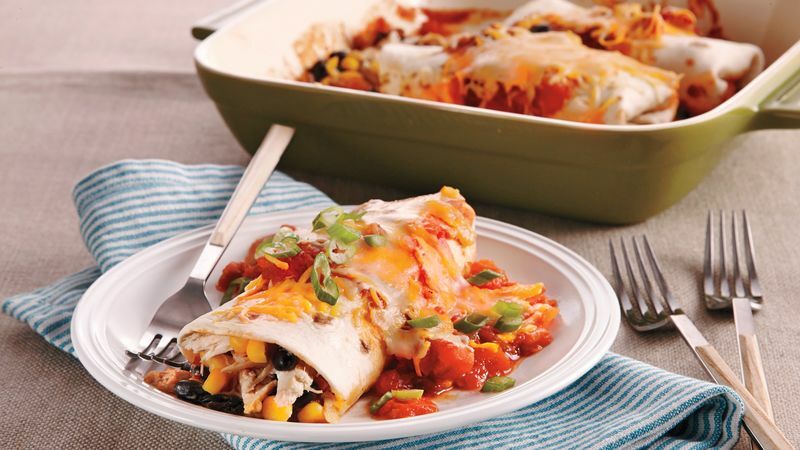 This tasty chicken and black bean burritos recipe has all the goods: rotisserie chicken, beans, corn, salsa, cheese and sour cream, and preparing them is so easy. Before you mix the filling ingredients together and start filling your burritos, you’ll notice that the ingredient list specifies that you should drain and rinse your black beans. Ever wonder why many recipes call for this step? And, what is that thick liquid in a can of beans, anyway? The answer is simpler than you may think. In most cans of beans, that liquid is a mixture of water and salt to keep the beans fresh. It naturally becomes a thick liquid because of the starch from the actual beans. By rinsing the beans, you are drastically reducing the amount of sodium that would otherwise be added to your recipe. Some recipes like soups or casseroles may call for the whole can, liquid included, to naturally thicken the recipe, but in the case of these burritos, rinse those beans off so the burritos aren’t too messy and are lower in sodium! You’re likely a big burrito fan after trying this recipe. Want to try your hand at even more? We have a bunch of burrito recipes, from breakfast burritos to beef burritos and more. Want to learn how to make enchiladas after that? Read this article and you’ll be a pro almost instantly.